In recent years, the American Association for Cancer Research (AACR) has expanded its efforts to catalyze advances in cancer research globally and support its members residing in 107 countries in addition to the United States. Nearly a third of the AACR’s more than 37,000 members reside outside the United States. The organization has undertaken several international activities to promote scientific excellence and the exchange of ideas among cancer researchers around the world. One important initiative this year was the landmark conference held May 4-6, in São Paulo, Brazil—the AACR International Conference on Translational Cancer Medicine. This conference, the first of its kind in Latin America and held in cooperation with the Latin American Cooperative Oncology Group (LACOG), convened a broad spectrum of cancer researchers and presented an overview of state-of-the-art translational cancer research. 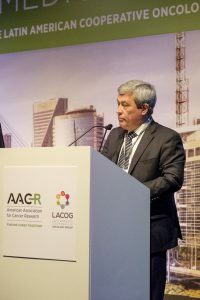 Carlos Arteaga, MD, PhD, Past President of the AACR, addresses the crowd at the AACR International Conference on Translational Cancer Medicine, held earlier this month in Brazil. We asked conference cochair Carlos L. Arteaga, MD, Past President of the AACR, and Donna S. Hall chair in Breast Cancer Research and director of the Center for Targeted Therapies and Breast Cancer Program at the Vanderbilt-Ingram Cancer Center in Nashville, Tennessee, to share with us the significance of this conference and key highlights from the event. Can you tell us how this conference came about and what the purpose of collaborating with LACOG was? One of the goals of the AACR is to reach outside the United States, to other continents and regions, and contribute to the improvement of cancer science. During my tenure as President of the AACR, I was charged with developing this strategy for Latin America. We had our first visit in March of 2015, and the purpose of this visit was to identify a niche where the AACR can help advance cancer science in the region, and that area was translational cancer medicine. Latin America has many basic scientists addressing several basic research questions, and they also have a wealth of clinical investigators, but we heard from them that a gap in connecting these two areas of cancer research needed attention. Based on the input from members of LACOG, the AACR, and the members of the Program Committee, we developed a landmark conference that bridges basic and clinical research and fosters translational cancer research in Latin America. Overall, the Latin American initiative was two-pronged. First, to generate a recurrent symposium focused on translational cancer medicine that would attract cancer investigators from the region, and to establish a conference program that would include experts both from the United States and Latin America covering important translational themes. I am pleased to note that we exceeded expectations in terms of attendance at the conference. Second, to contribute to the training of young investigators in the region that would lead to developing the next generation of new leaders of cancer science in Latin America. This conference also aimed to foster collaborations between the local speakers and speakers from outside of Latin America. I am sure that as we speak, many joint projects are being developed already. What areas of translational cancer research were discussed at the conference? 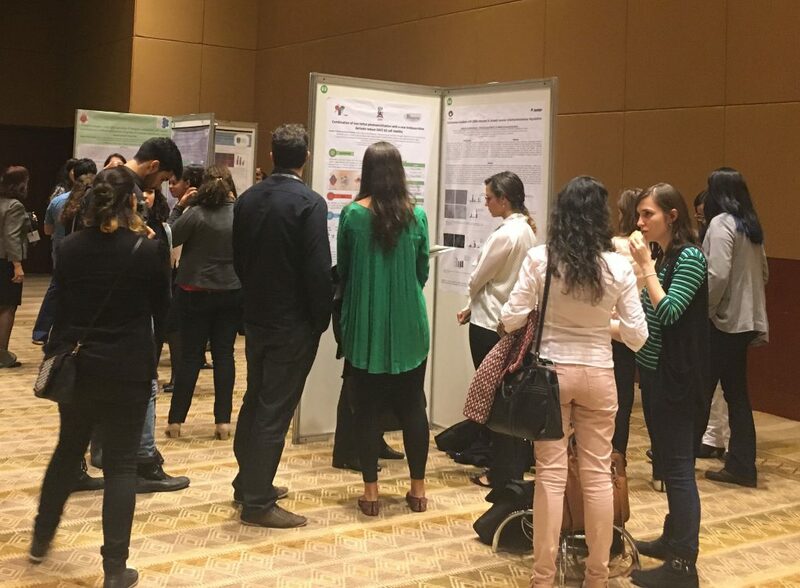 The conference was designed to cover a wide range of topics with potential clinical applicability, all supported by molecular biology and basic science. Latest advances in translational cancer medicine were discussed, including cancer immunotherapy, targeted therapies, genomic medicine, epigenetics, combinatorial therapies, drug resistance, DNA repair and PARP inhibitors, and liquid biopsies, among other topics. We had two keynote speakers. One speaker was from São Paulo, Dr. Luisa L. Villa, who spoke about cervical cancer—a major problem in the region—and the different facets of cervical cancer prevention. The other keynote speaker was Dr. William Hahn from the Dana-Farber Cancer Institute, who spoke about the use of tumor genomics to discover mechanisms of drug resistance and the generation of combination therapies. What are some of the challenges with advancing cancer research in this region? Most challenges faced in this region are those that are faced by many other countries around the world, including low levels of public awareness about the disease; inadequate availability of training, particularly for young investigators and physician-scientists; insufficient investment in cancer research by the countries in this region; and the challenges faced by clinical investigators in balancing their time between academic investigation and regular cancer care. For this particular conference, the challenge we had is that Latin America is a big region and there was little participation from countries other than Brazil; this is something we have to work on as we organize meetings in this region in the future. The importance and value of cancer research can only become evident by increasing public awareness about the health and economic burden of cancer in Latin America and globally. What was the takeaway message for the AACR from this conference? The takeaway was that this first step was absolutely the right thing to do, and perhaps also the responsibility of the AACR to continue to do this every year, and to do our best to expand our efforts to other countries in the region. The AACR has the opportunity to play a role, make an investment in this region, to expand our membership, and to raise awareness of the global battle against cancer. What hope do the AACR’s programs and collaborations in Latin America bring to cancer patients? We hope that by increasing the awareness about new cancer treatment opportunities, there would be an impetus for obtaining approvals for modern cancer drugs that are not quite there in this region. We also hope that by contributing to the improvement of the number and quality of cancer scientists we can expect to see an increase in the number of new discoveries and an increase in clinical trial activity in the region. In the end, this would all benefit patients, but this is only the beginning. Conference attendees at a poster session at the AACR International Conference on Translational Cancer Medicine. This conference, the first of its kind in Latin America, was held in cooperation with the Latin American Cooperative Oncology Group. ← Do Genomic Approaches to Selecting Cancer Treatment Yield Better Patient Outcomes Than Traditional Approaches?